Born into a family of musicians in the city of Afogados da Ingazeira, Pernambuco, at the age of eight Flávia “Flavinha” Ferreira began playing any instrument that she could put her hands on. The first was the cavaquinho, a small instrument of the guitar family, and then was the guitar, the accordion, and the keyboard. Flavinha grew up listening to several musical styles such as jazz, bossa nova, baiões of Luiz Gonzaga, and Latin songs that were played at home, thus inheriting a diversity of musical styles that are always present in her compositions today. 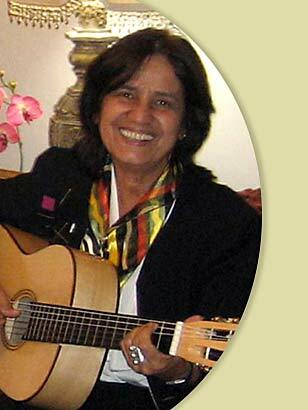 Always looking to improve her technique of playing solo and accompaniment at the same time, a style that differentiates her from other musicians, she went to Recife, capital of Pernambuco, in 1970. Since 2001, she has been living in Miami, where she formed a duet called Feeling & Saudade with Cuban singer Ligia Cabrera featuring a repertoire comprise of Cuban and Brazilian songs with new arrangements for guitar and flute. Currently, they are working on their new CD, "Feeling & Saudade”, scheduled to be released in July 2009 in Miami and December 2009 in Recife, Brazil. She participates in several projects including the SHE SAID, a musical group of 16 women that perform as a group or as smaller groups musically formed for each specific event. She has also participated in the literary project Brava Gente Brasileira em Terras Estrangeiras Vol. I & II, a poetic anthology created by Angela Bretas, with the participation of 30 Brazilian writers that live around the world.